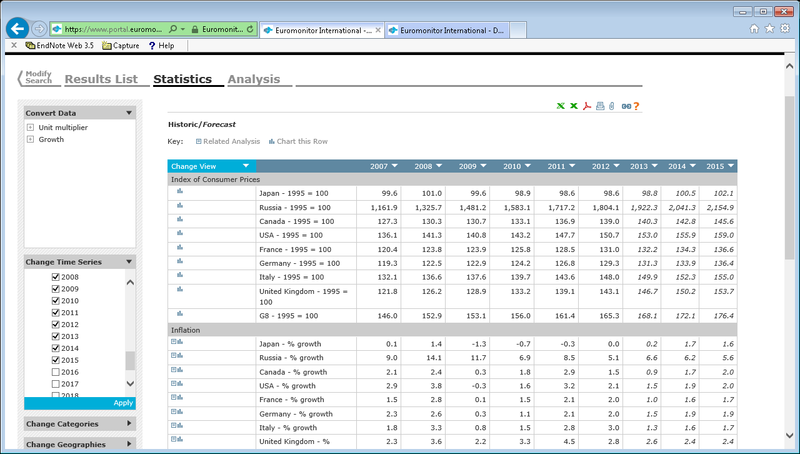 Passport (formerly GMID) from Euromonitor International is an great source of global market, industry and country data. This includes macroeconomic data such as the consumer prices index for different countries. 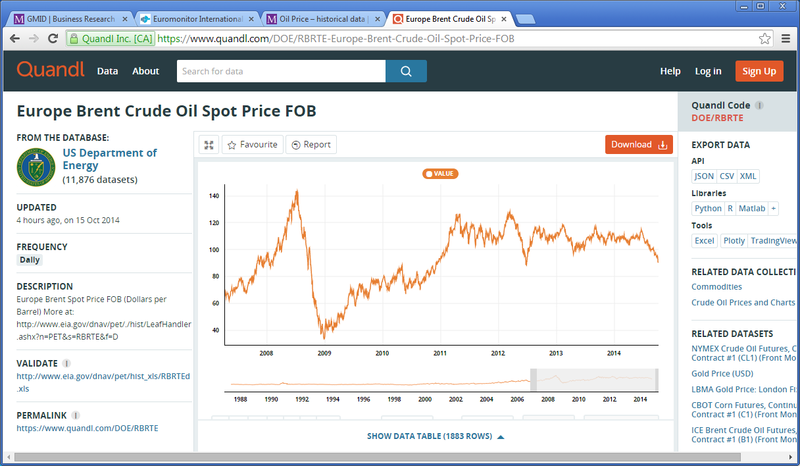 On Passport the variable is named “Index of Consumer Prices” so just searching for “CPI” does not find it. To get the forecast values for future years you need to select Change Time Series from the left-hand side menu and add the additional years that you want. The forecast values appear in italics as in the screenshot below. Passport (formerly GMID) from Euromonitor International is by no means the only database that provides CPI and other macroeconomic data. Other sources include Bloomberg, Datastream, and Global Financial Database. Consumer prices indices are calculated by various providers e.g. national sources (United Kingdom Office for National Statistics), OECD, IMF, and the World Bank. Quandl is one easy way of searching these free online sources. 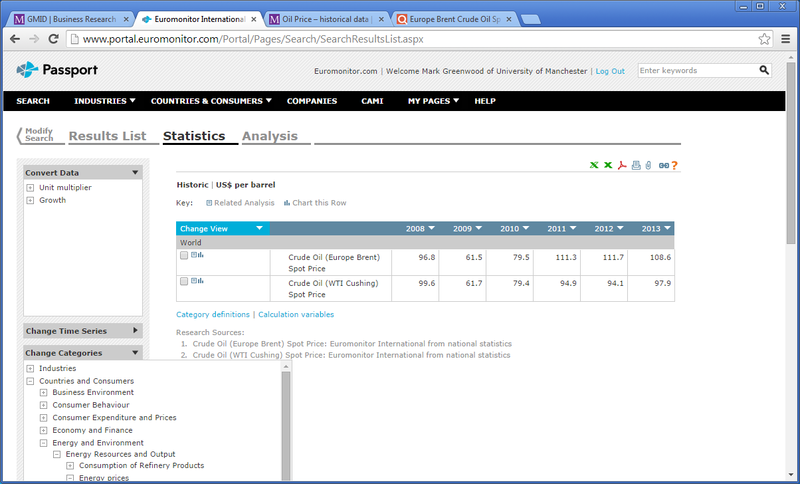 Passport (formerly GMID) from Euromonitor International is an excellent source of industry overview reports. The Passport Industrial Market Reports collection has over 3,000 reports covering 18 countries, including all the G8 countries, Brazil, Russia, India and China. 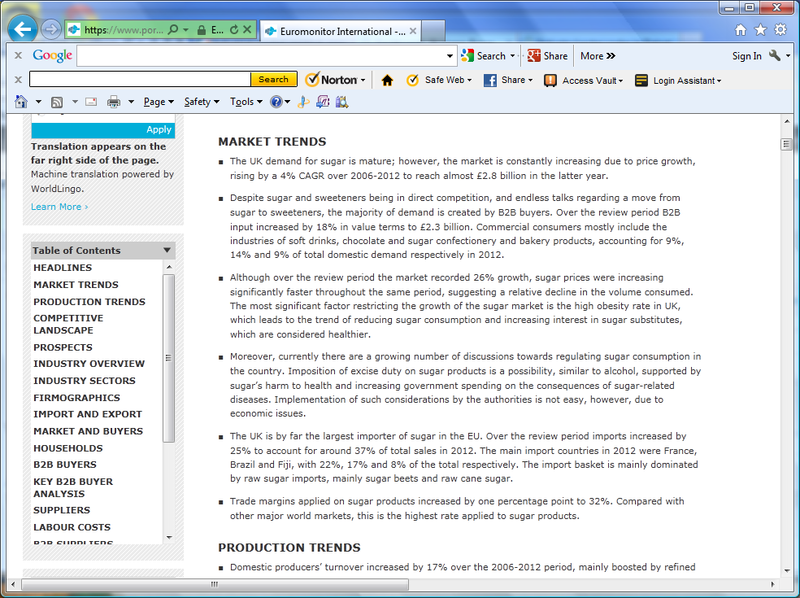 This screenshot shows a section of “Sugar in United Kingdom: ISIC 1542 – Industry Overview, 15 Jan 2013”. The report includes: market trends, competitive landscape, prospects, industry overview, import and export, and industry attractiveness index. It also includes supply chain information – buyers and suppliers at the industry level. To search the industry overview reports in Passport (GMID) – login and select Industries then Industrial. For information information on the reports available browse the Euromonitor International Industrial Markets Research page. The following video from Chad Boeninger of Ohio University Library is one of several giving advice on using Passport GMID. Ohio University have a slightly different subscription to Passport GMID so things may be slightly different for University of Manchester users. The Cambridge Judge Business School (CJBS) Library recently published a blog post “Top 5 best databases” to highlight their most popular premium databases. It is a great list if you are interested in exploring key University of Manchester database with just a little adjustment to account for differing subscriptions. EBSCO Business Source Complete – We have Business Source Premier our largest business journals database with articles covering all aspects of business and management. Capital IQ – We have a trial access to Capital IQ (one user access) – [Update June 2014 – Following the successful trial we now have Capital IQ.] There are a range of other databases for researching company and financial market information – see Researching Financial Markets for a summary from a research perspective. Factiva – from Dow Jones, Factiva is a great choice for business news – covers the most important newspapers worldwide and a large number of trade journals. Passport (from Euromonitor) – used to be called GMID (Global Market Information Database) then Passport GMID – a great source of global market, industry and country data with an emphasis on consumer goods. 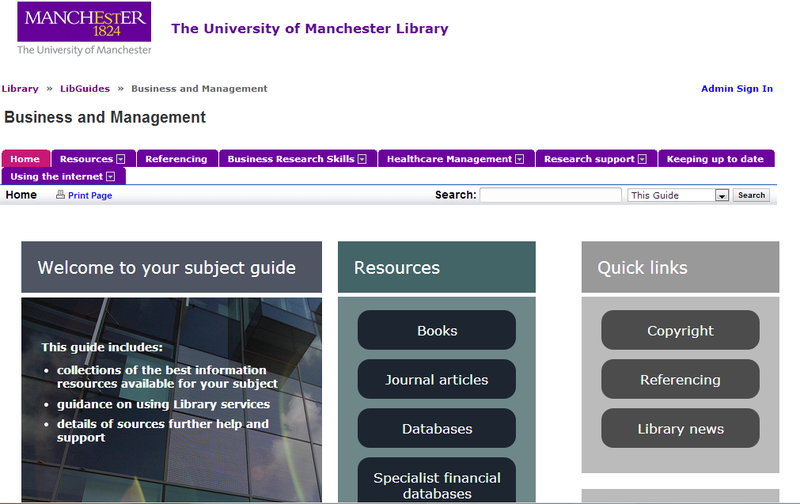 For a fuller list of databases available at University of Manchester browse the business and management pages (LibGuides). You might also be interested in our getting started guides. 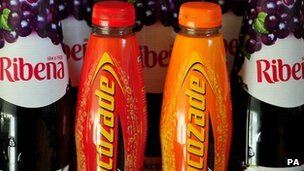 It was recently reported that GlaxoSmithKline (GSK) have sold the Lucozade and Ribena drinks brands to Japanese firm Suntory for £1.35bn. GSK chose to get rid of the well-known UK brands after deciding to focus on its core pharmaceuticals business. from Lucozade and Ribena sold to Suntory for £1.35bn (BBC Business News, 9 September 2013). For background information on the soft drinks market. Note. All KeyNote market research reports are for the UK market. Global Market Information Database (GMID) from Euromonitor has now been renamed Passport. At the moment you access Passport (formerly GMID) as before, e.g. 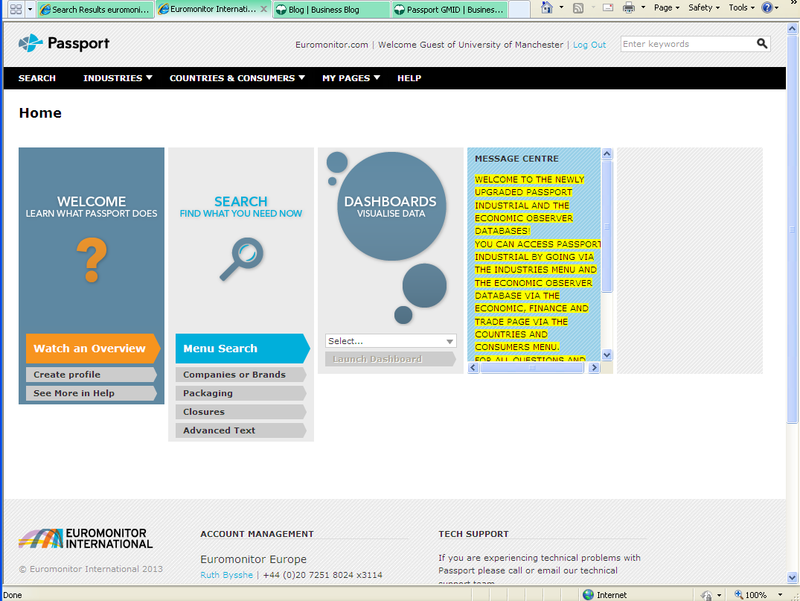 from the University of Manchester Library business and management databases page or the databases A to Z list. When you login you will get this welcome page. Passport is an excellent source of consumer market research reports and data, industry report and general macro economic data. 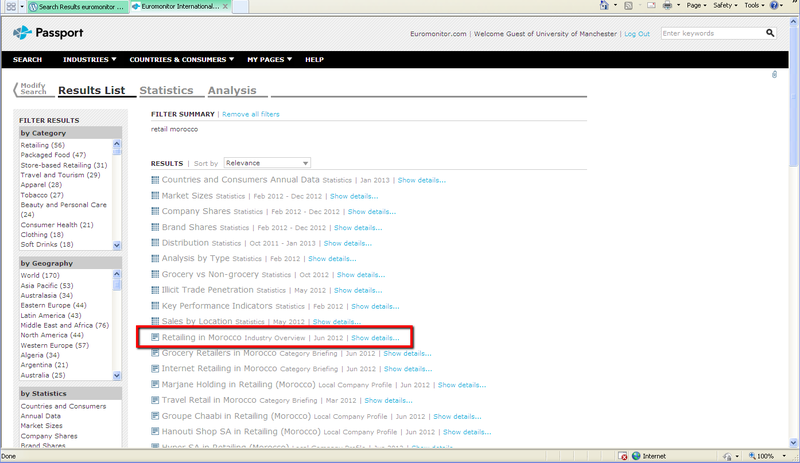 The most recent enquiry was for the “Retailing in Morocco Euromonitor 2012 report”. For a quick search you can use the Enter keywords search box at the top right – “retail morocco” gave the results below. Selecting the title Retailing in Morocco gives direct access to this June 2012 Euromonitor industry overview report – you can convert to a PDF file (25 pages) to download. GUEST post – This is a slightly edited version of Michael Halperin’s post “Puttin’ on the Ritz …” on the Datapoints blog. Forbes has a number of “richest people” lists in its magazine including Forbes World’s Billionaires and Forbes 400 The Richest People in America. In addition to names, photos, and net worth, the lists have information on residence, age, and source of income. Using Forbes’ data, Wikipedia has compiled a convenient list of the Top 10 Richest People in the world by year from 2000 on. Capgemini and RBC Wealth Management’s 2012 World Wealth Report is a freely available annual survey of “High Net Worth Individuals” (HNWI) from 70 countries. HNWI are defined as those with financial assets, excluding residence, of more than 1 million US dollars. Capgemini also discusses “Ultra HNWIs” individuals with financial assets of more than 30 million dollars. The report includes statistics on type of financial assets and a ranking of high wealth individuals by geographic area and country. Two additional standard sources of information about the rich are the Luxury Institute and the Ipsos Mendelsohn Group. Ipsos Mendelsohn does an annual U.S. study of 14,000 adults living in households with at least $100,000 in annual income. Although the University of Manchester Library, like the Penn Libraries, does not have access to their surveys of the affluent, you can often find data from these surveys cited in articles within the Business Source Premier or ABI/Inform databases. Try searching for luxury institute or mendelsohn affluent survey and search within the full-text. The U.S. IRS Tax Stats Personal Wealth Statistics is published every three years. Affluent Investing (UK 2012); Consumer Attitudes Towards Luxury Brands (UK 2011), and Luxury Holidays (UK 2010). Luxury Travel: Experiencing the Best (2012) and Luxury Alcohol in the BRICS: How the BRICs are Reshaping the Luxury Alcohol Industry (2012).